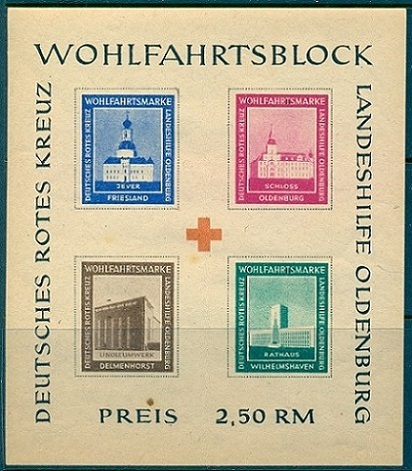 Local stamps for Oldenburg were produced during 1948. These stamps, in the form of two souvenir sheets, were actually a private issue by the German Red Cross to raise money for reconstruction projects around Oldenburg. A reminder: One must realize that in the months and years following the collapse of the Third Reich, up to about 1948, there was really no civilian or commercial infrastructure, no local government, and the only national governments were those of the Allied occupation military forces. All of the local issues of Germany from this period, especially the ones with obliterating overprints on the stamps of the former Third Reich, have been heavily counterfeited. Authentic mint and used stamps from this period are actually very scarce. One must assume that unauthenticated mint condition examples of some of the local issues are either forgeries or reproductions. Likewise, one must assume that unauthenticated used condition examples from this period are either of "philatelic" in origin or have been favor-canceled. These all have minimal philatelic value. If one is buying unauthenticated examples of the post-war local issues, please keep this in mind and DON'T spend too much money on them. 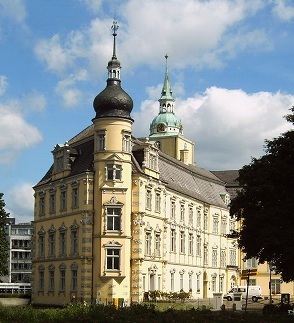 The city of Oldenburg and the surrounding area survived World War II in pretty good shape, as the Allied bombing around the city was minimal during the war. The population of Oldenburg and its neighboring towns, located in West Germany, increased tremendously after the war, as this area became one of the main destinations for German refugees from the Soviet occupation zone. The souvenir sheet shown above is one of two "philatelic" products produced by the German Red Cross in 1948. This souvenir sheet was produced both perforated and imperforate. The imperforate one is shown above. The sheet sold for 2.50 Reichmarks, with all the proceeds going to the German Red Cross. The souvenir sheet was not valid for postal use. The four "postage stamp" designs in the souvenir sheet depict, from top left to lower right, a building in Jever, Oldenburg Castle, the Linoleum Factory in Delmenhorst, and the City Hall in Wilhelmshaven.